Lead your homeschooling high schooler to the Shire, where “in a hole in the ground there lived a Hobbit”. Your student will witness good and evil being exposed and evil being conquered. Written to accompany British author J.R.R. 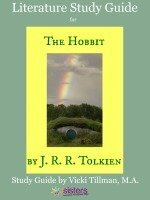 Tolkein’s 1937 multi-genre novel, this literature study guide by Vicki Tillman helps you get the most out of The Hobbit. Literature study guides from 7SistersHomeschool.com inspire students rather than tire them with busywork that kills the story.